What is Codeine (codeine phosphate)? Codeine, the active ingredient in codeine phosphate, is a so-called analgesic, a medicine designed to relieve pain. Codeine decreases pain signals or stops them from reaching the brain, thus reducing or eliminating pain. Codeine (codeine phosphate) is used to treat pain from a wide range of sources, including headache, the flu, common cold, menstrual pain, lumbago, rheumatic pain, post-operative pain or pain from illness. 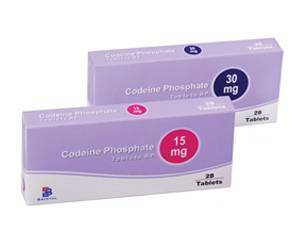 Codeine (codeine phosphate) tablets should be swallowed whole with some liquid, preferably with meals to avoid stomach distress. If you are taking more than one dose of codeine a day, remember to leave at least four hours between doses. If you have missed a dose, you may take it as soon as you remember, unless it is almost time for your next scheduled dose. Never take an extra codeine tablet to make up for the forgotten one. See package leaflet for more information. Codeine (codeine phosphate) is available in the following dosage strengths: 15 mg, 30 mg and 60 mg tablets. Strength and daily dose must be determined by a doctor. Always follow the prescription exactly – never take more or less than your doctor recommends. Codeine (codeine phosphate) should only be given to children on the advice of a doctor. Constipation. This can be avoided by drinking plenty of fluids and eating fiber-rich foods. Nausea. This side effect is usually only temporary and will disappear once the body adjusts to the use of the medication. See package leaflet for a complete list of possible contraindications, warnings and other side effects. Codeine should only be used with your doctor's approval if you are pregnant or breastfeeding. Codeine should in any case be avoided during the last weeks of pregnancy as it may contribute to breathing problems after birth. Alcohol intensifies the effect of this medicine, increasing the risk of drowsiness and dizziness. It is therefore advisable to reduce or stop alcohol consumption while taking it. Codeine phosphate may cause drowsiness, dizziness or sleepiness. Please be aware of this and stay out of traffic if you experience these side effects.